Phuket (Thailand) – January 18 2018 (travelindex.com) – Hosted by the Ministry of Tourism and Sports and sponsored by the Tourism Authority of Thailand, February’s Thailand Yacht Show (TYS) will attract industry leaders and regional consumers alike by combining the best aspects of yacht charter, the boating industry and the maritime luxury lifestyle. At a Press Conference in Bangkok today, Prakob Wongmaneerung, Vice Governor of Phuket, Nithee Seeprae, Executive Director of Product Promotion Department of TAT and Andy Treadwell, CEO and Founder of the Thailand Yacht Show, along with numerous officials and key business leaders, gathered to re-confirm their commitment to promoting Thailand as Asia’s premier yachting hub. Their objective is to position Thailand as a new luxury tourism destination for the world’s high-spending yachting community. The Thailand Yacht Show is conceived to promote superyacht charter holidays, yacht tourism and on-water sporting activities in one of the world’s most beautiful yet virtually undiscovered cruising destinations, to seasoned marine tourists as well as a new, affluent but as yet uninitiated consumer audience from Asia. Unlike any other boat show in the region, TYS is conceived as a “try it and see” event which offers a truly immersive experience for newcomers, with cruises, demonstrations and yacht parties for guests to discover the lifestyle first hand. TYS boosts Thailand’s image as an international yachting and luxury tourism hub and will attract and engage foreign direct investment, positively impacting the high-end tourism industry in the region. The economic benefits for Thailand’s businesses will include the creation of more jobs and high-end leisure infrastructure and facilities, as well as developing existing first-class natural, cultural and lifestyle assets. All tourism service sectors will achieve positive economic impact and benefits. Through its partnership with the Thai government, the Thailand Yacht Show team is undertaking an international destination marketing campaign to bring yacht owners, as well as prospective charterers and buyers, to experience Thailand’s luxury maritime lifestyle first hand. Some tax and immigration issues currently remain unresolved, but Treadwell believes the government’s enthusiastic and proactive stance on eventually changing these reflects their genuine desire to get the world’s biggest superyachts coming to Thailand and the wider ASEAN region to spend their millions of tourism dollars. Renewable energy and latest developments towards sea conservation will be another highlight during the Thailand Yacht Show. “Advances in sustainable technology in transport – the marine industry as well as the automotive sector – are creating a wave of new green products. These are quickly becoming very “current”, sought-after trends and we are going to be introducing some of the most recent trends at TYS”, says Treadwell. BMW Thailand and Torqeedo Asia-Pacific will present their latest technology – the BMW i8, BMW i3 and the BMW iPerformance range (740Le, 530e, X5 xDrive40e and 330e) on the car side, and the Full Torqeedo electric drive system for boats. “Our showcase highlights one of the objectives and themes of this year’s Thailand Yacht Show – Sustainable Mobility. We are delighted with our progress and projects with partners such as TAT in assisting to create clean sustainable transport onto the water”, says David Hunter, Managing Director for Torqeedo Asia Pacific Ltd.
“BMW i continues to drive sustainable innovation with its futureproof technology and integrated approach. And now the high-voltage battery developed for the i3 is not only powering emissions-free mobility on the road, but on the water too. The BMW Group is supplying lithium-ion batteries to Torqeedo. 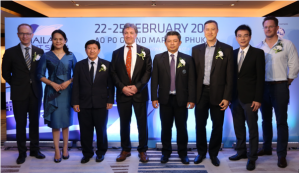 The marine drive system manufacturer is using them for energy storage in its high-performance Deep Blue electric drive systems.” further adds Lars Nielsen, Sales & Marketing Director for BMW Thailand. Returning to Phuket’s Ao Po Grand Marina, the third edition of the Thailand Yacht Show (TYS), will take place from 22-25 February 2018. The lineup for the third edition will feature more of the region’s premier yachting and luxury brands – from stylish superyachts to the latest launches. Local and international visitors will have a chance to view and even try out boats and yachts presented by the country’s leading boat dealers and yacht brokers. The extraordinary scenery of Phang Nga Bay will serve as a backdrop for electric shows, parties and social gatherings including VIP events on board yachts and floating night-clubs. The popular Demonstration Platform returns again, allowing more intrepid guests to test the latest yachting toys and accessories, and engage in diverse on-water activities. Verventia is a global marketing platform and business catalyst, introducing suppliers, distributors, and affluent audiences to new lifestyle products and services. The company’s portfolio of events and extensive connections facilitate the integration of networks to stimulate industry growth and business development. The dedicated efforts of its experienced team of professionals and partners, well-versed in the implementation of successful event and project management, enable them to deliver with the style, class and discretion required of the buyers and sellers we bring together in unique venues around the world. Verventia’s current portfolio comprises the Singapore Yacht Show, the Thailand Yacht Show, the Asia Pacific Superyacht Conference, the Asia Boating Forum, the Thailand Yachting Forum, and the Singapore Collection.